Youngji is the youngest, newest, and last member of beloved group KARA, which parted ways in 2016. That doesn’t make her any less popular, however. After all, she had the most votes in a televised competition to replace Nicole and Jiyoung. Although the girls of KARA have mostly gone onto solo careers, many fans still remember and love the group. Youngji is also pursuing a solo career, and we wish her all the best! We feel a deeper connection to the singer now. Recently, on her birthday in August, this young star posted a picture on Instagram with a Drilleys eco tote bag! Youngji always looks lovely. But this Drilleys eco tote just fits so perfectly with her look! She’s gone for the simple eco cross bag, natural canvas. The bright orange Drilleys logo adds a spark of color and fun. In this picture, she’s no doubt checking the small pocket at the top for her phone. The pocket snaps closed, and is a great way not to lose small valuables at the bottom of the bag. It’s a problem for many totes – but not Drilleys! The tote snaps shut at the top as well to help protect the contents. This eco cross bag has both small, sturdy carrying handles and an adjustable shoulder strap. 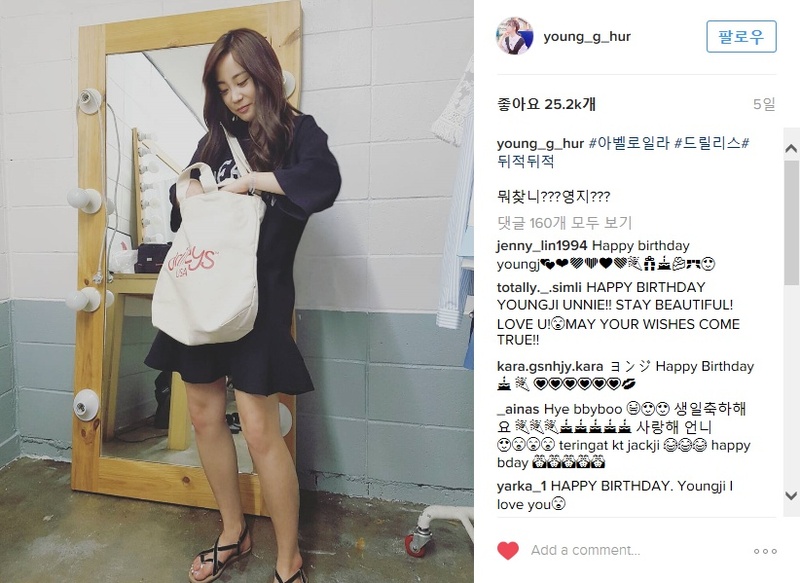 We don’t know who offered this Drilleys eco tote bag to Youngji on her birthday, or if she gave it to herself! Either way, she’ll be able to use it for years to come, a hard-working bag for a hard-working artist. Want to know more about Drilleys? The brand offers more of these great eco totes, as well as all natural espadrilles and other casual shoes. All eco friendly, all natural materials! Youngji isn’t the first Korean celebrity to wear Drilleys! We also saw our bags quite often on one of the most beloved Korean dramas, Weightlifting Fairy Kim Bok-Joo!! Share the post "Kara Star Youngji With Drilleys Eco Tote Bag"
Posted in CELEBRITY'S PICK and tagged celebrity pick, drilleys, drilleys totes, eco canvas totes, eco fashion, ECO TOTE BAG, kara kpop, korean celebrity, korean celebrity fashion, korean idols, kpop style, youngji. Bookmark the permalink.